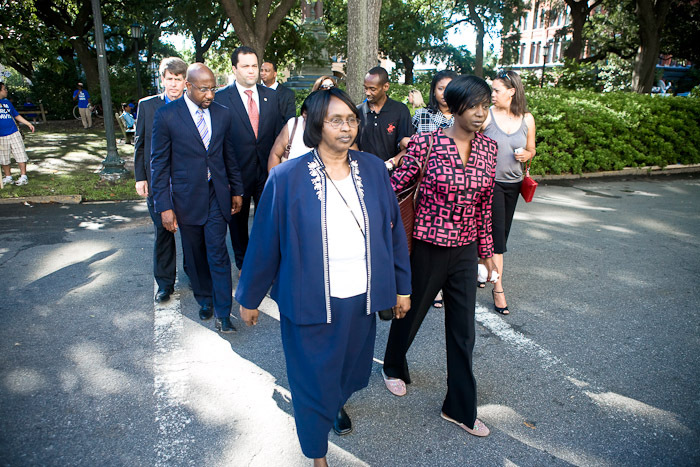 It has been a month now, but at the end of June I was in Savannah, Georgia for 4 days with Amnesty International and NAACP to photograph the activities around the Troy Davis evidentiary hearing. 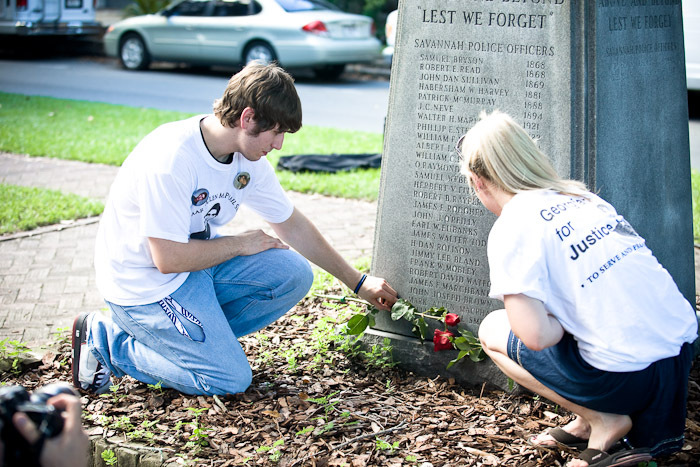 Davis has been on death row in Georgia since 1991 for the 1989 murder of off-duty Savannah, Georgia, police officer Mark MacPhail. 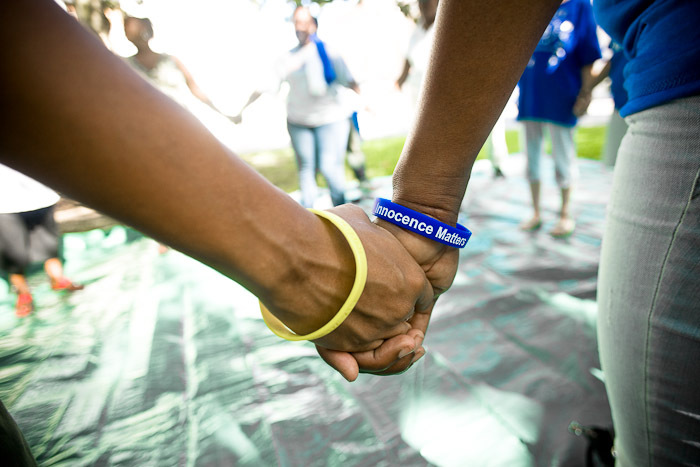 Davis maintains his innocence, claiming he was wrongfully convicted of the crime as a result of false identification. Since trial, 7 of the 9 witnesses have recanted their testimony, so strong questions of Davis's innocence are now being heard by the courts. Photos from my time in Georgia follow. 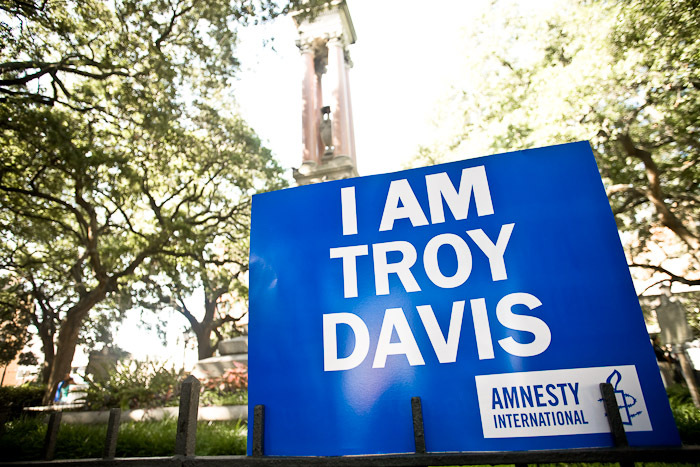 Above: Supporters of Troy Davis gather at a solidarity vigil in Savannah, which was held in conjunction with an international day of action around the case with vigils around the world the day before the court hearing. 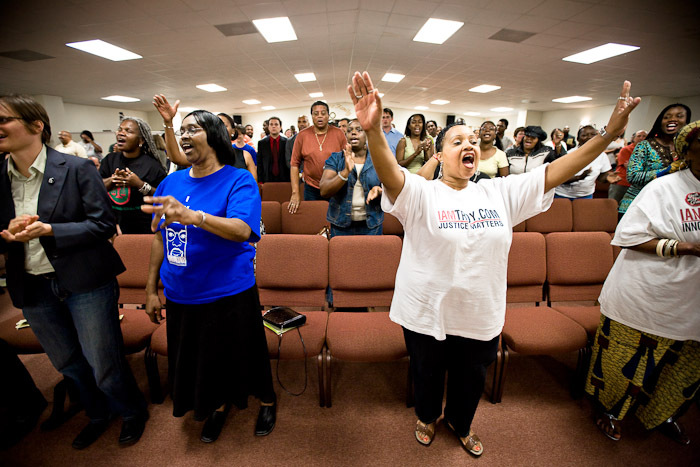 Troy's mother, Virginia Davis, is in the blue shirt at left. 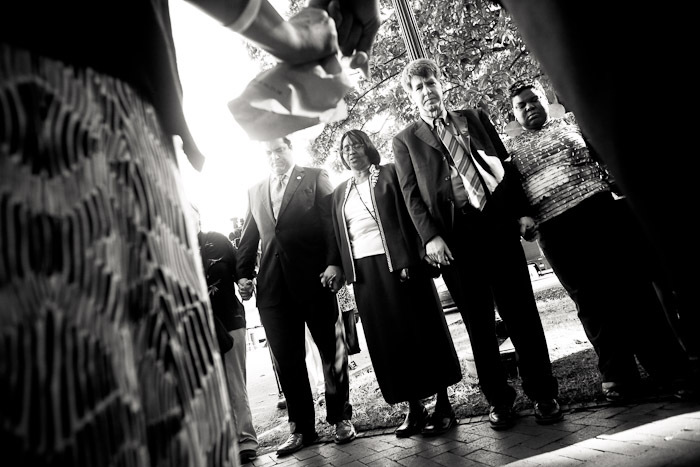 Above: Troy's mom, Virginia Davis, holds hands with Larry Cox (right), executive director of Amnesty International USA and Benjamin Todd Jealous (left), national president of NAACP. 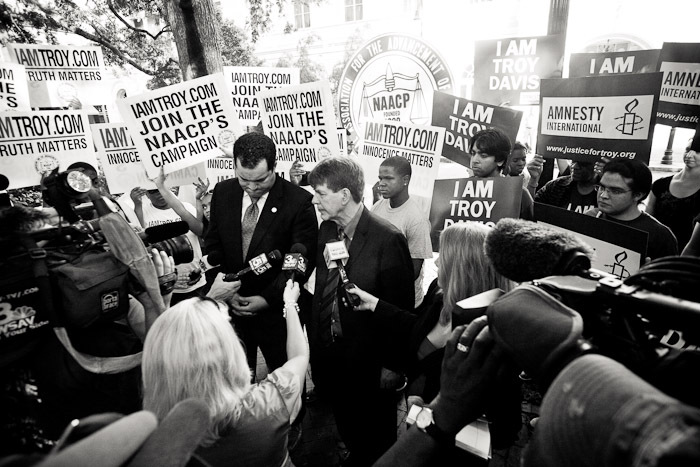 Below: Larry Cox (right), executive director of Amnesty International USA and Benjamin Todd Jealous (left), national president of NAACP, give a brief press conference outside the courthouse along with supporters who traveled from all over the US and Europe to attend the start of the hearing on June 23. 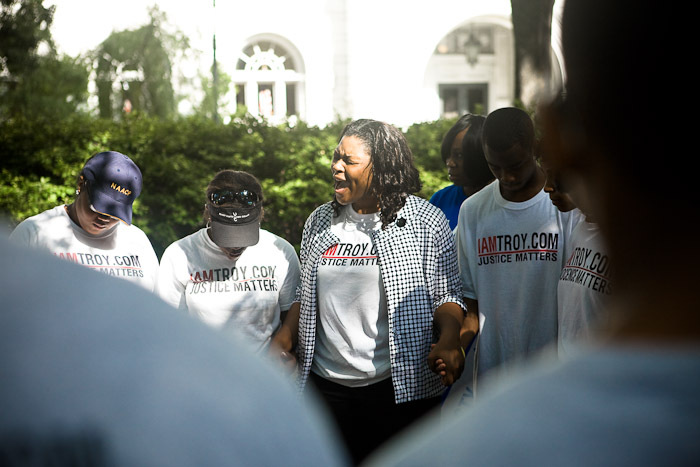 Below: Troy's family and supporters cross the street from the vigil in the park to the courthouse for the start of the hearing. Davis' mother (front left) and sister Martina Correira (front right) lead the group. 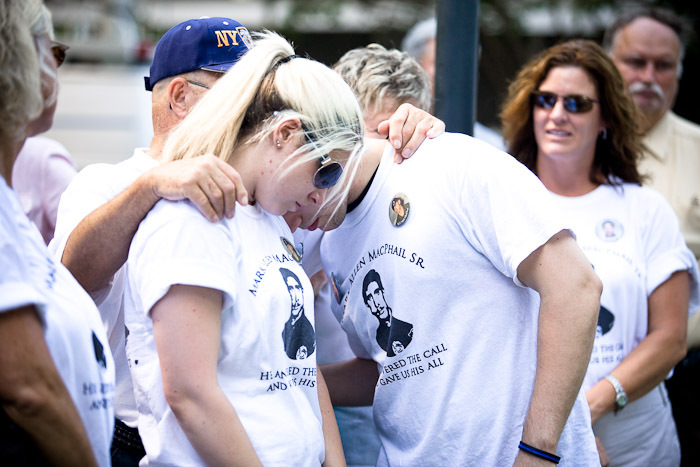 Next two photos: Madison and Mark MacPhail Jr., children of slain police officer Mark Allen MacPhail, hug at the June 22 vigil at the Savannah Police Officer's Memorial, follow by a rose laying at the monument where their father's name appears. 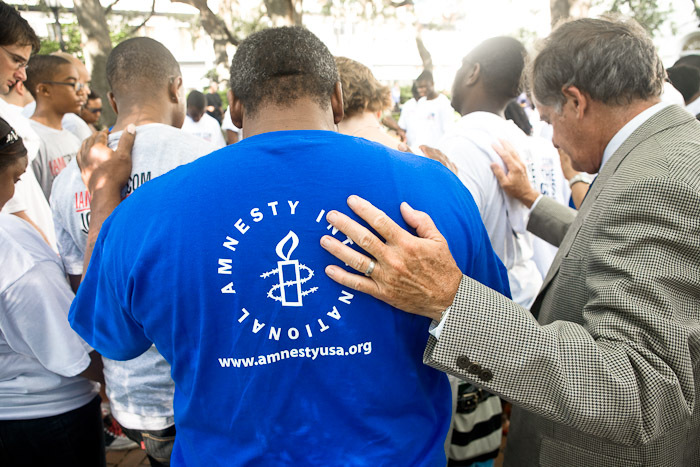 The remaining photos below are from vigils and prayer circles outside the court during the hearing. Unbelievable! If you don't want to be executed, don't run around shooting at other people! And look at what this country has become. People proudly admitting to be like a murderer. No wonder NObama was elected president and the country is going down the toilet.